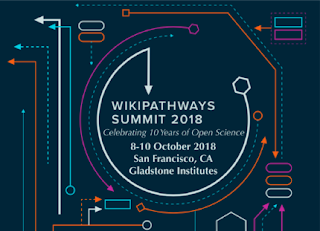 Found my way back to my room a few kilometers from the San Francisco city center, after a third day at the WikiPathways 2018 Summit at the Gladstone Institutes in Mission Bay, celebrating 10 years of the project, which I only joined some six and a half years ago. The Summit was awesome and the whole trip was awesome. The flight was long, with a stop in Seattle. I always get a bit nervous of lay-overs (having missed my plane twice before...), but a stop in Seattle is interesting, with a great view of Mt. Rainier, which is also from an airplane quite a sight. Alex picked us up from the airport and the Airbnb is great (HT to Annie for being a great host), from which we can even see the Golden Gate Bridge. The Sunday was surreal. With some 27 degrees Celsius the choice to visit the beach and stand, for the first time, in the Pacific was great. I had the great pleasure to meet Dario and his family and played volleyball at a beach for the first time in some 28 years. Apparently, there was an airshow nearby and several shows were visible from our site, including a very long show by the Blue Angels. Thanks for a great afternoon! Sunday evening Adam hosted us for an WikiPathways team dinner. His place gave a great view on San Francisco, the Bay Bridge, etc. Because Chris was paying attention, we actually got to see the SpaceX rocket launch (no, my photo is not so impressive :). Well, I cannot express in words how cool that is, to see a rocket escape the earth gravity with your own eyes. And the Summit had not even started yet. I will have quite a lot to write up about the meeting itself. It was a great line up of speakers, great workshops, awesome discussions, and a high density of very knowledgeable people. I think we need 5M to implement just the ideas that came up in the past three days. And it would be well invested. Anyway, more about that later. 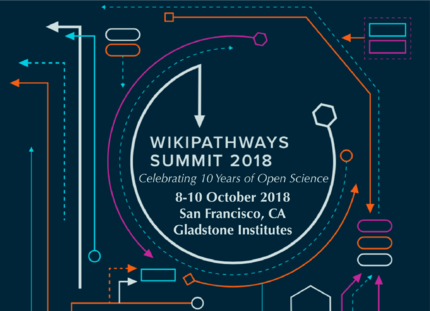 Make sure to keep an eye on the GitHub repo for WikiPathways.